Underfloor Heating can be used successfully with almost all forms of timber floor but achieving success requires specialist knowledge. It is very easy to install the wrong sort of UFH system, which can very quickly damage an expensive hardwood floor. By comparison, installing the right form of UFH can be the very best way of looking after a timber floor throughout its life. Osma Underfloor Heating has this knowledge plus long experience and it is the only company approved by English Heritage to provide UFH systems for Grade 1 Listed timber floors. Over the range of temperature change in a building between heating ON and heating OFF, timber does not change dimension to any significant extent. However, it does expand and contract as its moisture-content changes, which will happen naturally as the seasons change. Wood floors should be laid at a moisture-content of 10-11%. When the heating system is turned ON or OFF, and the moisture-content of the floor changes, it is very important to ensure that the moisture-contents of the upper and lower surfaces of the timber remain the same. If one surface becomes drier than the other, the timber will either cup or crown. For information on flooring restoration services in Exeter. Click Here. There are many master craftsmen who are specialists when it comes to laying and maintaining a wide variety of wooden floors. The Bradleys Homeguide can recomend the best type of wood surface and treatment for your home and can get the job done quickly and cleanly. Our Hardwood Specialists can offer free quotations, and all our staff are fully trained and experienced. We also, only use the best materials to ensure that your floor not only looks good but will be be durable and last for years. Step on to any hardwood flooring and you'll appreciate the warm and inviting tones and colour. As one of the worlds most versatile floor coverings not only do you get traditional beauty but also practical advantages such as lasting good looks, resists stains, including wine and food, warm to the touch, easy to clean, fully restorable, hygienic and dust free, especially good for allergy sufferers. Solid wood flooring is exactly as it sounds, the individual boards of the floor are made from one continuous plank of wood as apposed to engineered woods which are solid wood veneer on top of a ply base. An increase in demand for hard wood floors has seen prices slowly fall as more and more companies are realising their benefits. When looking at the lifespan of solid wood floors they are excellent value for money as they never have to be replaced and are easily re-finished to suit interior changes. Solid wood floors truly are "beauty that lasts a lifetime". What is the difference between solid wood and laminate? Solid wood flooring is made from one solid plank and so is solid the whole way through; it has not been engineered or glued. Laminate flooring is a photograph of wood printed onto a high-density base and then finished with an acrylic lacquer. There is no solid wood in a laminate. Is Solid Wood Flooring suitable for use with Radiant heat underfloor heating systems? So long as the tubes do not touch the wood this should be fine. A laminated underlay vapour barrier should be used between the concrete and the floor. 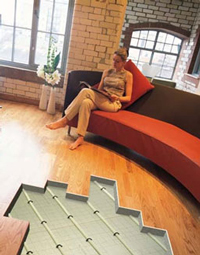 Click here to view Underfloor Heating Specialists in Devon. Yes – providing the linoleum remains tightly glued to the original sub floor, this should not be a problem. Yes, although it can be slippery, so think about your own environment before deciding. For example, whether you have small children and pets. There is very little difference in durability and the choice really comes down to aesthetics and your own personal choice. Which solid wood should I choose? Other than the walls, the floor represents the largest expanse of colour or pattern in a room. It should complement the surroundings already present in the room. Which rooms can I install solid wood flooring? Solid wood is suitable for any room except the bathroom. You must also consider whether the floor will be on, above or below-grade (in general terms this is the floor level. Above grade is above ground, below grade is below ground – ie. In a basement). Due to potential moisture problems, solid hardwood is not suitable in basements but are fine for on or above grade rooms. The method used for your hardwood installation will depend upon the type of product you have chosen, where the flooring will be installed and the type of subfloor. Nail down, glue down & floating are the three type of installation. For instance, if you are remodeling your kitchen, some products can be "floated" over most subfloors, including vinyl or ceramic tile, eliminating the mess and cost of tearing up the existing floor and installing a subfloor. No – the prefinished floor contains multiple layers of a UV-cured polyurethane. This gives the floor a tough, durable and smooth finish which is very easy to maintain. However you must never damp mop a solid wood floor – water and wood do not mix. There are a number of products now available which are specifically for wood floors. Care and maintenance of your floor. Solid hardwood floors are the easiest of all floor surfaces to keep clean and looking new. Solid hardwood is truly the floor for a lifetime.